This entry was posted in Light and tagged Fire Engine, Fire Truck, Flash, Shutter Speed, Street by Michael Willems. Bookmark the permalink. This is a really interesting effect. 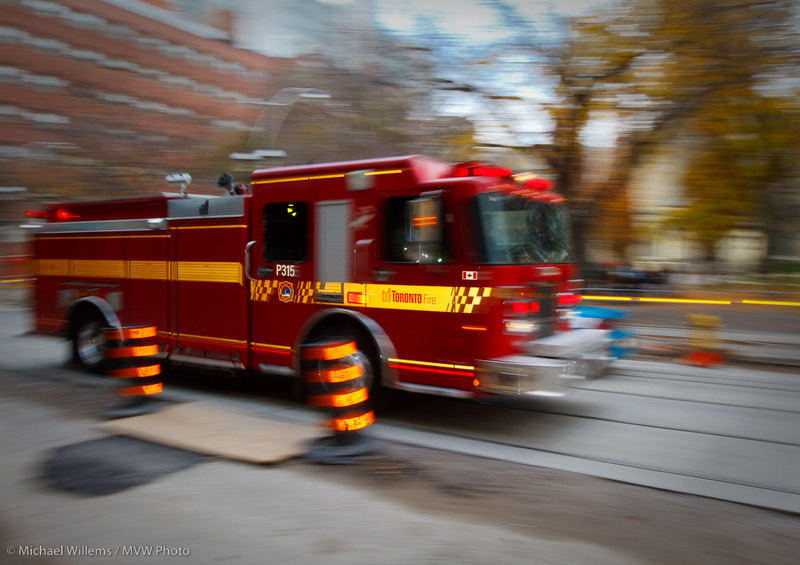 Why are parts of the picture in focus – towards the middle of the fire truck and others not? The entire truck is moving at the same speed so I’d have thought it would be uniformly out of focus. It must be one of those pesky Laws of Physics things. It also looks like it’s knocking those traffic bollards or whatever they are aside. But yes, it’s a great picture. I can almost hear the siren. Ha ha! Look carefully: I popped up my flash (and all this with one hand – that is what I am most proud of). I knew that the reflective bits of the truck would reflect my 1/1000th of a second flash. Thus freezing those bits. And yes – that truck was LOUD. Plus of course even the notion you DO see is greater toward the edges, and taht IS a laws-of-geometry thing: a wide lens setting exaggerates the size (and hence motion, which is ds/dt) at the edges. Draw it all out and you’ll see how. Ah yes, and your flash startled the driver so he did knock those bollards over. Usually when I photograph a vehicle using flash it over-exposes any reflective markings including the license plate. I guess photo opportunities like this are why Canon keep the button placement etc. pretty constant between camera models. Experienced photographers operate their cameras instinctively without looking. Your 7D works so similarly to other cameras in their line that you could think “picture” and not “camera”. Exactly. Shoot a lot and it gets easy. Although I must say I was happy when this one worked out: I would have a McDonalds coffee cup in my other hand just when it was least convenient. “And I hope you agree that is not a bad fire truck photo.” I agree that it is not a bad photo, however, this is a fire “engine” and not a fire “truck.” Yes, there is a difference. Cool shot and and an excellent tip though. Oh I see. Is that in Canada and US as well as the UK? If so, what is the difference? OK, looking at my post, it appeared to be Net-trollish. I didn’t mean for it to come out that way. My apologies. Not sure about outside of the States but generally speaking, a “truck” has a large aerial ladder (often around 100 feet in length) or a snorkel (articulating platform). Trucks generally don’t carry much or any water and/or hose. Engines, or pumps generally carry between 500 to 800 gallons of water, have a large pump and carry several hundred feet of hose. Of course there are many exceptions and variations to this including some highbreds . Oh no, no worries at all. I am a stickler for accuracy. So this is an engine.. a pump I imagine (the “P” gives that away – correct?) – cool! That would be my guess too that this is “Pump 315.” Again generally speaking, Pumps and Engines are usually pretty close to being the same thing. Engines and Trucks generally are not. BTW, I just clicked on your image to view it at a larger size (so I could read the number) and it’s even cooler than I first thought. Great image! This lightning speed of a shot is superb and thanks on the random tip. Great use of the pop up as well. I’ll have to jot this down for future reference! Agreed on the pop up usage-fill flash set to low.